NOTE - Codes usually look something like this: FaKE2v43COdE (this is NOT the code) or sometimes like this: ITSFRIDAY. Make sure when you copy and paste the code that there aren't any spaces on either side of the code. If you have the right code, it will then say "You just received 6 Swag Bucks"! Siign up today if you love free money! BTW, since April 18/10 I've already earned almost enough for $2,400.00 in Amazon gift cards! How much have you earned? Come share in the Frugal Freebies discussion forum! That's 120 easy SB every month! 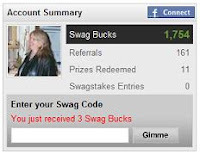 Earn 2SBs for clicking thru the "View Our No Obligation Offers And WIN Swag Bucks", I just read each offer carefully, clicked on "Skip" or "No" or "See Next Offer" for anything I wasn't interested in, and you can do this every single day to earn SBs!